On January 11th in Annapolis, our legislators will reconvene in the state house at 12:00 pm. As they take their seats, the clock will start ticking on our 90 day legislative session and our opportunity opens to pass some great environmental laws. The truth is that we need you now more than ever. With the federal political climate, we must take a stand to defend the progress we’ve made here in Maryland. Make sure you stay tuned to your inbox for upcoming action alerts and updates from this legislative session. PS: Don’t miss our 2017 Environmental Legislative Summit in Annapolis on January 26th, register here. In the week following the election, one thing has become clear: There has never been a more important time to be working to protect strong environmental policies. It has been heartening to have so many people around me looking for ways to be more active in communicating with their elected representatives. This advice comes both from my experience as a lobbyist for Maryland LCV, but also my years as a legislative staffer. I’ve been on both sides of the desk, and this is what I’ve learned. Go ahead. Try it at home. We were all surprised on Tuesday night. Many of us were left wondering- where do we go from here? I am concerned about potential rollbacks of the progress we have made on so many environmental issues but I am encouraged by the good that came out of this election. In Maryland, I am proud to work alongside a dedicated staff, board of directors, and coalition of environmental groups who will keep fighting climate change, restoring the Chesapeake Bay and waterways, and protecting our natural legacy for future generations. Voters in Howard County took a stand for democracy by passing Question A, which will create a Citizens Election Fund to elevate everyday voters in our county elections. This ballot measure will help tear down barriers to running for office and ensure Howard County residents always have the access to their elected officials that they deserve. But this is bigger than just one county. Our nations ineffective campaign finance laws have long been a topic of local and national discussion. At Maryland LCV, we feel that we can never make true progress on the environment until we get big money out of politics. Tuesday night was a big step in the right direction and we are proud to have played a role in organizing the campaign. With your help, we also endorsed candidates for Baltimore City Council this year and did pro-environment mail in Baltimore City, supporting a message of clean water and air for all Marylanders regardless of where you live. We believe in environmental justice for everyone and we are proud to be working on this issue every day through the Latino community organizing we do with our Chispa Maryland program. And voters sent climate champions to Congress to fight for our future. We should all be proud of the work we did individually and collectively to make progress in Maryland and regionally this election cycle. We will take lessons learned and come back even stronger to elect climate champions at every level of government in 2018. You can bet that we will also continue working hard to hold our elected officials accountable and we'll need your continued support every step of the way. In the coming months, we'll be asking you to do your part by calling, emailing, and meeting with your legislators as we work to bring clean energy to Maryland, protect Maryland from the harmful impacts of fracking, and protect our waterways and open spaces. But if you're ready to get to work and start making a difference today, sign up to volunteer with Maryland LCV or support us in other critical ways. States, particularly Maryland, have an opportunity and an obligation to continue demonstrating what environmental values look like and why it’s imperative we move forward together on addressing climate change – still the biggest threat to future generations. Heartfelt thanks to all of you. This evening marks Maryland LCV’s 16th annual Environmental Leadership Awards. Tonight’s honorees have demonstrated that the best way to empower everyday citizens is to build greener, more sustainable communities throughout Maryland. Likewise, the best way to restore power to voters in our elections is to get money out, and the solution for Howard County is Question A. Question A is a microcosm the for public campaign funding movement swelling throughout the country. Led by Howard County Councilmember sponsors Jen Terrasa and Jon Weinstein, Howard County Council sent the proposed amendment to the county charter to the ballot last March. If Question A passes on November 8th, The Citizens' Election Fund would become the second public campaign funding system for local elections in the state of Maryland and the first in the country to appear on the ballot all by itself. We all can agree that elected officials are more accountable to the interests of voters when they are not beholding to corporate and big dollar campaign donors. Maryland LCV believes that protecting the environment means increasing government responsiveness to the concerns of voters, especially at the local level. That is why Maryland LCV is fully invested in scoring a win in Howard County this fall (#HoCoYesOnA) and building capacity for Howard County electeds to lead on the environment, just like the honorees of the 2016 Environmental Leadership Awards. My day-to-day world as an environmental lobbyist tends to be very small: meetings, conference calls, legislator visits, policy research, and data entry and analysis, most of which happen between our Maryland Avenue office and the legislative campus just two blocks away. On October 5th, however, I had the opportunity as a representative of the Maryland Climate Coalition and the Political Director of Maryland LCV, to join a small delegation of legislators and other stakeholders to visit the off-shore wind project off the coast of Rhode Island. It was a whirlwind (pun intended) tour of the first off-shore wind project on the East Coast, showcasing the extraordinary power of off-shore wind, the cutting-edge technology, as well as the beauty of the turbines in action. After being met at the airport by a representative of the Maryland Business Network for Off-Shore Wind, the delegation – which included Senator Kathy Klausmeier (D8-Baltimore County), Delegate Tawanna Gaines (D22-Prince George’s County), and Delegate Sally Jameson (D28-Charles County), as well as representatives from the Town Creek and Abell Foundations – joined scientists, industry representatives, government agency staff, and environmentalists on a small touring boat as it charged through active seas out to the newly completed turbines. You can see from the pictures that the weather was variable, ranging from clear blue skies to more blustery and ominous cloud cover. Many of us found the experience of facing the wind and the rough sea to be a challenge, but it was clear that the turbines were perfectly designed for the elements. Although the project experts gave us a great deal of detail about each of the elements of construction, I think that many of us were somewhat caught off guard by the sheer size, as well as the beauty - of what we were looking at. On Tuesday evening, more than 35 people gathered at the Owen Brown Interfaith Center in Columbia for the national pilot of Democracy Initiative’s new “Road to Democracy” training. The mix of high school students, Fair Elections Howard staff, and popular democracy advocates took time to feel out each other and the room before settling into their seats. Touching on the U.S. Supreme Court decisions of Citizens United v FEC (2010) and Shelby County v. Holder (2013) decisions, Democracy Initiative’s Senior Strategist and Organizer Angie Wells helped attendees connect the dots between big money in politics and voting rights challenges in various forms during the two-hour workshop. 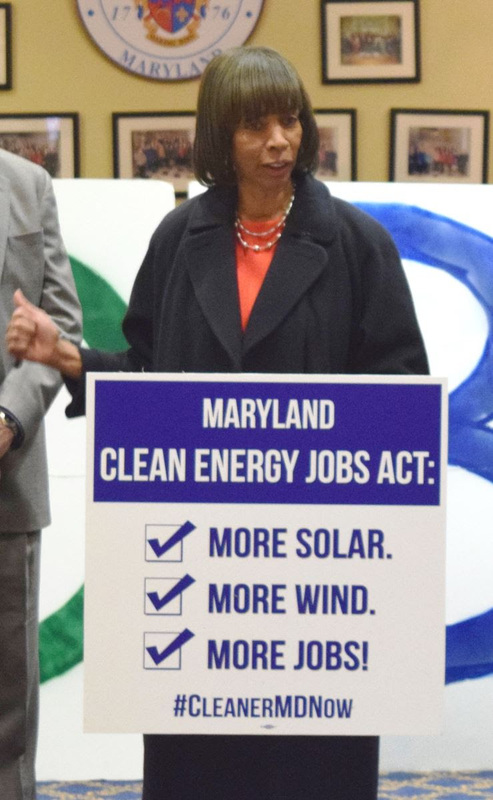 Together with the Maryland General Assembly, you supported your legislators in championing the renewal and expansion of the Greenhouse Gas Reduction Act and the Clean Energy Jobs Act this last 2016 legislative session. “I’m honored to be the recipient of the 2016 Legislator of the Year Award from the Maryland League of Conservation Voters. Thank you for standing together with me and with your neighbors in support of this important cause. Maryland, and in particular Baltimore, has some of the worst air quality on the East Coast and these legislative wins are moving our state in the right direction. Protecting air quality and improving the environmental health of all Baltimoreans will always be my top priority, as will continuing to work with my State colleagues to advance the cause for all Marylanders. We’re all in this together.” Senator Catherine Pugh, pictured right, on the importance of climate action. historic legislation called the Pollinator Protection Act, which bans a class of bee-killing pesticides called neonicotinoids (a.k.a.neonics). I’ve been involved with the bill since it was drafted because we have seen a sharp increase in bee hive collapses in the past several years. Maryland lost over 60% of its hives in 2015, and 50% in 2014. The numbers leapt from 20% hive losses in 2013. And that’s why it was so important that Maryland passed the Pollinator Protection Act last year. It could not have come at a more critical time to help our suffering pollinators. 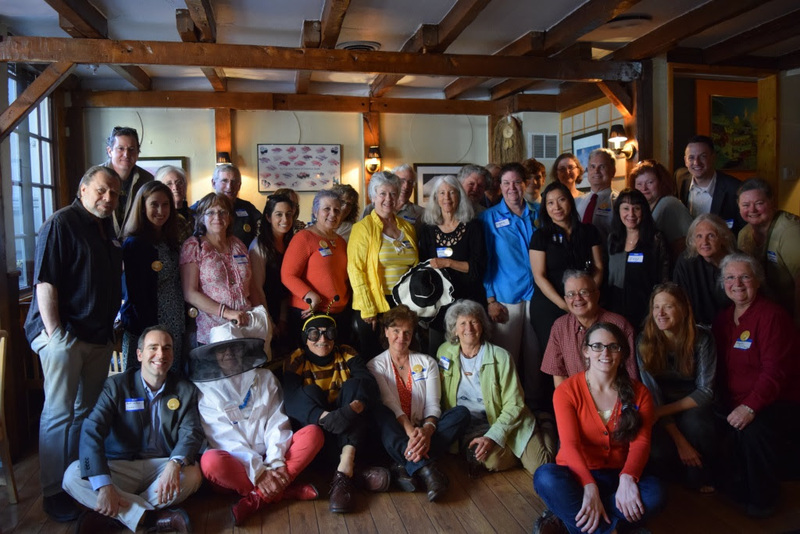 Will you join me and my fellow beekeepers on October 13th to celebrate our victory, and my colleagues, on the passage of the 2016 Pollinator Protection Act? Numerous studies have found that neonicotinoids harm bees, birds, butterflies, and other pollinators, which we depend on to pollinate one in three bites of food we eat. Do you know the history of our most prestigious environmental award in Maryland? We were founded in 1979 by a small group of volunteers who knew that our environment needed protecting, and still does. So they established the Maryland League of Conservation Voters to be the watchdog of our elected officials and ensure they vote for the environment and our communities. John Valentine Kabler was one of our founders. As a native of Baltimore, he was spurred to environmental action in the wake of the Three Mile Island crisis in the late 1970s. Mr. Kabler inspired a handful of his environmental colleagues to become active in political campaigns. Together these leaders founded the Maryland League of Conservation Voters in 1979. Until his death in 1996, John Kabler was a key leader of the Maryland conservation movement. It has been 20 years since Maryland lost one of its toughest environmental advocates and we plan on honoring John V. Kabler at our annual Environmental Leadership Awards Dinner. Will you join us? On Tuesday night, more than 70 Citizens' Campaign Fund supporters gathered at Kelsey's Restaurant in Ellicott City to attend the Fair Elections Howard Kickoff. From the outset, we could sense that folks were eager to learn more about the issues but even more excited to fellowship with like-minded neighbors. This event marked the official start of a movement in Howard County that began when the County Council passed the "citizen funded campaign system" resolution in March. With election day now less than two months away, the effort to get citizens of Howard County to "Vote Yes on A" is in full swing. Joined by Senator Ben Cardin, Congressional member John Sarbanes, and Councilmembers Jon Weinstein, Jen Terrasa, and Calvin Ball reminded the crowd that when office seekers choose to opt into a public campaign funding system, it broadens and deepens their engagement with communities they serve. More simply put, "It changes the company we keep!" Take action today and pledge to vote YES on Question A!